Put out you're your pumpkins, and your apple-spice scented candles, because fall is here! It's time to start getting into the holiday spirit. 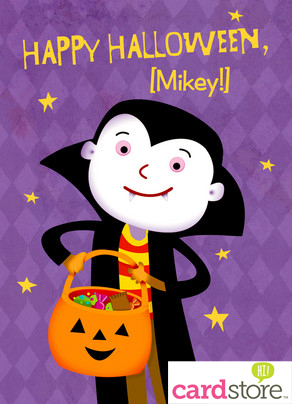 Cardstore has really stepped it up this year with their collection of Halloween and Thankgiving cards. AND, they're all just $0.79! Just use coupon code CAM2734 at checkout for your discount. Click HERE to look around. Whether you want to throw a spooktacular Halloween bash, or invite your family and friends to Thanksgiving dinner in style, or maybe just want to send a holiday greeting to someone far away who you can't travel to this year. With Cardstore's new and improved site, you can find the perfect card in a snap! And don't forget, they make it so simple to send warm wishes to friends and family, far and near, with free shipping, and the ability to schedule your send up to a year in advance. I'd say that's more than enough reasons to surprise a loved one (or 10) with a perfectly personalized "just wanted to say hi!" card this season. Happy Fall, Halloween, and Thanksgiving! This deal is valid thru 10/31.